I'm developing a new range of mind music tracks which, depending on the listener, may provide a more soothing alternative to isochronic tones and binaural beats, and some additional brainwave entrainment filters for an enhanced effect. To begin with, these new tracks will be featured exclusively on the Mind Amend YouTube channel. What's the difference between Mind Music and Isochronic Tones? They are both created using exactly the same type of amplitude modulation effect, but instead of repetitive beats, mind music uses vibrations in the soundtrack which produces a more soothing sound. Amplitude modulation effects are applied to a single tone, which is essentially turning the volume on and off at regular intervals. This produces a sound that sounds like a fast repetitive beat. On their own, isochronic tones can sound a bit harsh and abrupt to listen to, so music is added to them to make them more pleasant to listen to. Amplitude (volume) modulation effects are applied to the music which produces repetitive vibrations. The vibrations stimulate and influence your brainwave activity in the same way that isochronic tones do. The music vibrations produce a more soothing sound, which may be a more appealing alternative than isochronic tones for some people. In addition to the amplitude vibrations, some mind music tracks will have hypnotic sound effects, and additional brainwave entrainment filters to enhance and add impact to the overall effect. For tracks which include auto pan entrainment, both the left and the right ear will receive a stimulus, but at different times during the modulation cycle. The right ear will receive the first vibration as it pans to the right for the first part of the cycle. Then, the left ear will receive the next vibration as it is panned to the left. This can produce a dissociative and hypnotic sensation, which can be very relaxing and ideal for meditation and sleep tracks. Some mind music tracks will also feature 3D sound placement effects. 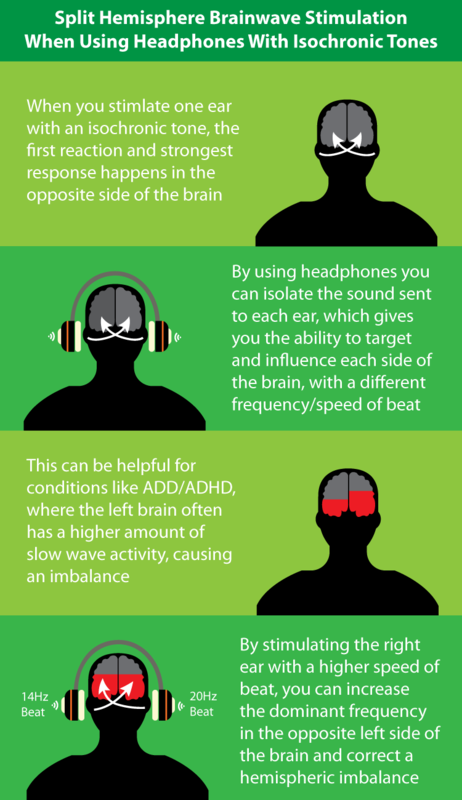 The sound can be manipulated to focus your attention in a specific direction. An auditory illusion can be created to make you believe the sound is coming from in front of you. Helps to focus your attention on the screen, a book you are reading or any work in front of you. Used on tracks for studying, working and increasing focus. Another ingenious way of using the 3D audio technology is to create a perceived rocking motion effect. The modulation effects can be altered to make it feel like you are gently rocking from side to side or back and forth. It's incredibly relaxing to be slowly rocked back and forth or from side to side, and it's a natural tried and tested method for getting babies off to sleep. I'm sure you've also experienced how the gentle movement of a train carriage can quickly relax your mind, and send many people off into a deep sleep where they miss their stop! Mimics the relaxing sensation of a rocking crib or chair. The illusion of a gentle motion helps to calm your mind and quickly relaxes you. Where auto pan or 3D effects are used, it's highly recommended to use headphones to experience the full effect. Works with any standard set of headphones, earphones or in-ear earbuds. Focusing your mind on the vibrations in the music can help to increase the overall effect on relaxation and sleep tracks. Adjust the volume to a level you feel comfortable with. Note: On each new mind music track, whether on YouTube or available on my site, the track description will make it clear whether any auto pan or 3D sound effects have been used, or whether headphones are recommended for that particular track. Binaural beats and isochronic tones are two different methods of producing brainwave entrainment, with audio and repetitive beats. They are both used to stimulate and influence your brain's electrical activity, and guide you to specific and more desired mental states. In this post I'm going to highlight the key differences between the two methods, and which one has been proven scientifically to produce the stronger effects. Are Isochronic Tones Just a Different Type of Binaural Beat? One of the most common misconceptions I come across, is that isochronic tones are just a different a type of binaural beat. But that's incorrect. They are both different methods of creating audio brainwave entrainment. Binaural beats have been around for much longer and can be traced back to 1839, when they were discovered by German scientist Heinrich Wilhelm Dove. Isochronic tones are a much newer discovery and were first highlighted in a study by Arturo Manns in 1981. In his 1981 study, Manns was the first to report how isochronic tones produce a stronger brainwave entrainment effect when compared to binaural beats. Both isochronic tones and binaural beats stimulate and influence your brainwaves, using the sound of repetitive beats. This type of brainwave stimulation is known as ‘brainwave entrainment‘. Both methods work by stimulating your brain with continuous repetitive beats of a specific frequency. When your brain is stimulated with a repetitive beat, your dominant brainwaves start to fall in sync to the same speed of the beats. The time it takes for your brainwaves to synchronise to the beats can vary. But on average it's generally considered to happen after around 5 or 6 minutes of listening to the beats. The big difference between isochronic tones and binaural beats is the way the beats are created. Isochronic tones produce a much more distinctive sounding beat, which produces a stronger reaction in your brainwave electrical activity. Which is what ultimately makes them more effective and a stronger method of brainwave stimulation. The different between both frequencies is 10Hz, so the listener perceives a tone beating at a rate of 10 times per second, i.e. 10Hz. Again using the above example, if the second tone in the right ear was increased to 220Hz, the difference would be 20Hz, so a 20Hz beat would be heard. Why are Binaural Beats ‘Perceived' and Not Just Heard Like Normal Beats? Good question. With binaural beats the resulting beat you hear is a type of auditory illusion, created and heard inside your head. No actual beat is sent into your ears, just two plain tones at different frequencies. The brain recognises that the tones are different in each ear and somehow produces a resulting beat after processing them. 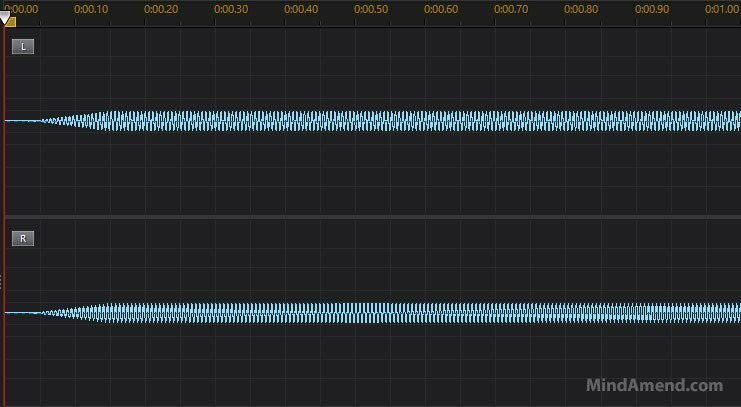 Looking at the snapshot above there isn't a visible beat, just 2 continuous waveforms for each left and right channel/ear. After the 2 tones are sent to each ear, your brain naturally converts the two different tones into a single beat, known as a binaural beat. The diagram above shows what a binaural beat waveform looks like when formed inside the brain. When determining the strength of a beat, the waveform is measured from the highest point to the lowest part of the curve/wave. As you can see from the diagram above, there isn't a very big distance between the highest and lowest points in the sound wave. You could almost compare it to a calm sea. In a research article by David Siever 2009, Entraining Tones and Binaural Beats, Siever noted that the modulation depth (difference between loud and quiet) is very small at just 3db, a 2 to 1 ratio. Compared to isochronic tones that easily produce 50db, which is a 100,000 to 1 ratio. In layman's terms, this means that isochronic tones produce a much more pronounced and distinct sounding beat. When measured on an EEG, binaural beats only produce a small response in the brain, and little to no impact on brainwave driving. So for brainwave entrainment purposes, isochronic tones are more effective and superior. You always need headphones to hear Binaural Beats tracks effectively. They produce a very shallow sound waveform compared to isochronic tones, which results in a weaker brainwave entrainment effect. They are not considered to be effective in the higher beta and gamma frequency ranges. You can't target a specific side of the brain, just the whole brain. Isochronic tones are consistent regular beats of a single tone. To explain it in the simplest of terms, an isochronic tone is a tone being switched on and off very quickly. The speed at which the tone is switched on and off is measured in terms of Hertz (Hz). The image below shows the waveform of a 10Hz isochronic tone. The example above shows a 1 second snapshot of a 10Hz isochronic tone. 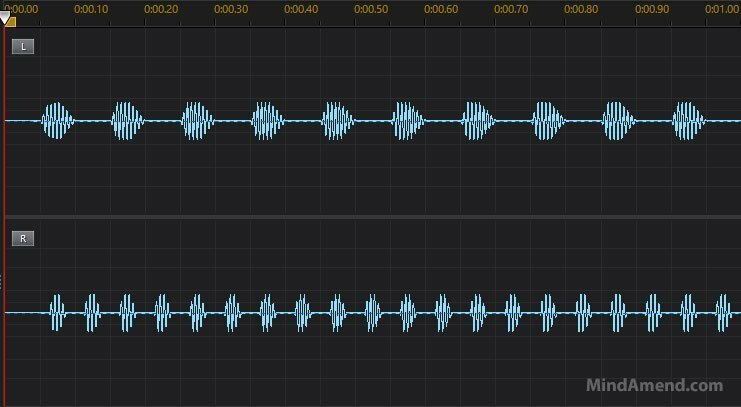 If you count the waveforms you'll see they are repeated 10 times over this 1 second time period. They produce a more distinct tone/beat, which results in a stronger ‘cortical evoked response' in the brain, making the stimulation more effective. Standard sessions/tracks don't require headphones. With advanced sessions that require headphones, you have the ability to stimulate each side of the brain with a different frequency of beat. This enables you to lower or increase the activity in one side of the brain. This process is known split hemisphere stimulation. For a more in-depth explanation of how isochronic tones can influence your mental state, check out my article here: How Isochronic Tones Work – Includes links to research resources. Isochronic tones are a fast and effective audio-based way to stimulate your brain. Among many of the benefits, they can help improve focus, relaxation, energy levels, sleep and more, without taking drugs or needing any special equipment. What isochronic tones essentially do, is guide your dominant brainwave activity to a different frequency while you are listening to them, allowing you to influence and change your mental state and how you feel. The effects can be felt within a few minutes and all you literally have to do is click play and listen. Are isochronic tones as effective when combined with music? How Do You Use Isochronic Tones and What Are The Benefits? Isochronic tones can be used in many different ways for multiple benefits. When I first discovered them around 2006 their most popular use was for meditation and relaxation. While they are still very popular for meditation, an increasing number of people are using them to help with studying, to improve focus and concentration in particular. The main concept behind isochronic tones and brainwave entrainment methods in general is the ability to change your dominant brainwave frequency and guide your brain to a preferred or optimum mental state. Stress or Anxiety Relief – When you are feeling stressed, agitated, anxious or angry your brain will usually be producing an increased amount of high beta activity. Low beta or alpha frequency isochronic tones will help to lower your dominant frequency, reducing feelings of stress or anxiety. Meditation and Relaxation – Sometimes it can be hard to really relax properly, and it can be even more difficult to reach a deeper state of meditation, especially for those new to meditation. Using low alpha and theta frequencies will help guide your brain to these deeply relaxing and sometimes enlightening mental states. Increase Focus, Cognition and Memory – When it's time to study or work, our brain isn't always firing on all cylinders and ready to focus. If you are feeling tired, unmotivated and distracted, isochronic tones in the beta range will elevate your brainwaves up to a more optimal high focused state, and keep your mind there for the duration. Research has shown that Alpha stimulation can also be helpful in improving your ability to memorize and retain information. So it has become very popular among students, who listen to it while revising and memorizing information for tests and exams. Improving Sleep and for Power Napping – When you're struggling to get to sleep, it's very likely that your brain is producing too much beta activity. Brainwave entrainment tones can be used to reduce beta activity and increase more in the low delta frequency range. Helping you get to sleep faster. Energy and Motivation – Increasing the amount of higher beta and gamma brainwave activity can help boost your energy levels, and make you feel more alert. It's a great chemical-free alternative to caffeine and energy drinks. What are Isochronic Tones and What Do They Look and Sound Like? The example above shows a 1-second snapshot of a 10Hz isochronic tone. 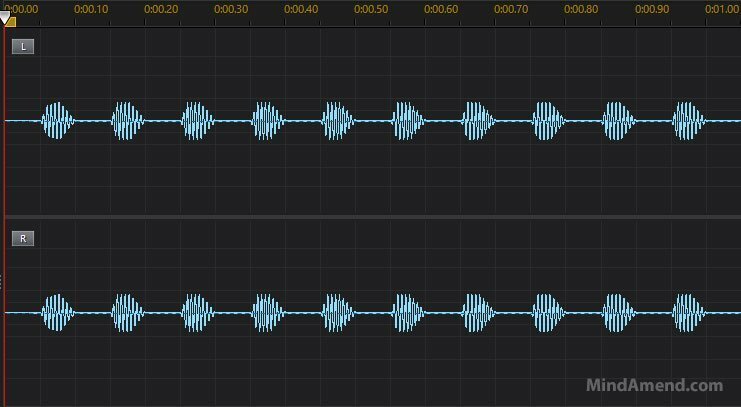 If you count the waveforms you'll see they are repeated 10 times over this 1 second time period. How Do Isochronic Tones Work and Affect Your Brain? Isochronic tones utilize a process known as brainwave entrainment, which can influence and drive brainwave activity to a more desired mental state. Entrainment occurs when the brainwave frequency starts to replicate that of the stimulus. With isochronic tones, the stimulus is in the form of a clear and repetitive beat/tone. The distinct and repetitive beat of isochronic tones produce what's known as an evoked potential, or evoked response in the brain. This is an electrical potential recorded from the nervous system, following the presentation of a stimulus. These electrical potentials can be seen and recorded using an Electroencephalograph (EEG). The process of brainwave entrainment relies on the natural phenomena of synchronization. Entrainment is defined as a ‘synchronization of two or more rhythmic cycles’ and you may already have seen or experienced it yourself, without knowing what was going on. Tuning forks – When you strike a tuning fork and then place another one next to it, the second tuning fork will automatically start to vibrate at the same frequency. Pendulum clocks and metronomes – If you placed a number of pendulum clocks or metronomes in close proximity to each other, and set them all off swinging at different times, within a few minutes they will all start to swing together in unison. Menstrual Cycles – It’s often found that when a group of women live in the same house together, their menstrual cycles will start to sync together. In college dorms, it’s regularly found that all the women on the same floor will have their periods at the same time. Fireflies – If you are ever lucky enough to witness fireflies in action, you will notice that as the night wears on they will start to flash in unison. Brainwave Activity – The frequency of your brainwave electrical pulses can be stimulated and influenced, by repetitive light flashing or sound rhythms and become synchronized to the same frequency of the light flashing or sound rhythms. When brainwaves become entrained and synchronized with the same frequency of an isochronic beat, this is known as frequency following response (FFR). The frequency of the stimulus/beats can then be changed and your dominant brainwave frequency follows along in step with it. By using the power of FFR, your brainwave activity can be guided to a more optimum frequency, to enhance or improve your mental states. For example, when you are very stressed or anxious, your brain will usually be producing an elevated amount of the higher beta brainwave activity. By stimulating your brain with lower alpha frequencies you can reduce the frequency of your dominant brainwave activity, helping to calm your mind and reduce the feeling of stress. The discovery of binaural beats can be traced back to 1839, by German scientist Heinrich Wilhelm Dove. Whereas isochronic tones is a much newer discovery, with the first study being published by Arturo Manns in 1981, which showed that isochronic tones produce a much stronger brainwave entrainment effect, compared to binaural beats. Because binaural beats were discovered first and have been around for so long, many people incorrectly label isochronic tones as a type of binaural beat. In actual fact they are both just different methods of audio brainwave stimulation. With advanced sessions that require headphones, you have the ability to stimulate each side of the brain with a different frequency of beat, allowing you to lower or increase the activity in one side of the brain. Produces a very shallow waveform which can be more pleasant to listen to, but it only produces a very small ‘cortical evoked response' in the brain. The difference between both frequencies is 10Hz, so the listener perceives a tone beating at a rate of 10 times per second, i.e. 10Hz. Good question. With binaural beats, the resulting beat you hear is a type of auditory illusion, created and heard inside your head. No actual beat is sent into your ears, just two plain tones at different frequencies. The brain recognises that the tones are different in each ear and somehow produces a resulting beat after processing them. As you can see from the diagram above the depth of the waveform is very shallow, especially when compared to the very clear and distinct space in between each isochronic beat. In a research article by David Siever 2009, Entraining Tones and Binaural Beats, Siever noted that the modulation depth (the difference between loud and quiet) is very small at just 3db, a 2 to 1 ratio. Compared to isochronic tones that easily produce 50db, which is a 100,000 to 1 ratio. This is why I always use isochronic tones on all my brainwave entrainment tracks and no longer use binaural beats. The most common way to use Isochronic Tones is for a short-term benefit. They provide a chemical-free alternative to things like coffee, energy drinks, alcohol, pills and other forms of medication. The key word here is ‘alternative'. They are not meant to replace any prescribed medication by a Doctor or medical professional. As an example, if you use a mediation session to deeply relax you, you might stay feeling chilled out for a few hours afterwards. But if you jump on a roller-coaster after listening, your brainwaves are going explode with beta and gamma activity from the adrenalin rush. It's important to make sure you are well hydrated before listening to Isochronic Tones, especially when using the higher Beta and Gamma frequency tracks. Around 75% of the brain consists of water, and you need to keep it hydrated to function well, especially when you are doing things that require a higher level of concentration. One of the main promoted benefits of using isochronic tones compared to binaural beats is that you don't need to use headphones. That said, using headphones can help to intensify the effect of an isochronic tones track, and the over-ear type can be very useful for blocking out external noises and distractions. You will notice with some of my isochronic tones tracks that I say you need headphones. This is required on the more advanced sessions, where a different ‘frequency of beat' is sent to each ear. What's the Best Volume Level to Listen to Them? There isn't an actual ‘peak volume' level I can recommend for everyone because you'll notice the beats will sound different depending on the equipment you use. With many portable devices like laptops, mobile/cell phones and tablets etc. they don't produce a lot of bass, so it can be hard to hear the tones on them and the volume often needs to be fairly high. If you listen with headphones on, you'll often find you can have the volume a lot lower for the tones to be effective. My best advice is to start off with the volume around half way and adjust it up or down from there to suit your preference. You'll want the volume loud enough to hear the tones quite clearly, but never so loud that it hurts your ears. Increasing the volume level can have some impact on the power of the tones. So sometimes if you find a track not having a strong effect on you, try increasing the volume a little bit, or try using headphones if you haven't done so before. For many people, isochronic tones can sound quite harsh to listen to on their own, especially when you are first getting used to the sound. To help improve the sound, they can be combined with music or ambient nature sounds, which is the most common way people listen to them. If you combine the right soundtrack with isochronic tones, it can have a positive effect on your mood and how well you receive the stimulation from the tones. Music taste varies from person to person, and as individuals, our mood and situation will often dictate a preference for different styles of music. This can have some impact on how effective isochronic tones can be. If you dislike a particular music genre, you are going to find it hard to sit through and respond to a track, which contains that type of music. No matter how effective and useful you believe the isochronic tones are going to be. Likewise, if you like a particular music genre, it's going to make you feel more comfortable and relaxed, and put you in a better and more receptive mental state. This is one of the key reasons why I provide a wide variety of different soundtracks with each of my products. So you can pick and choose which soundtrack suits your preference and mood. One of the potential drawbacks with brainwave entrainment is that over time your brain can start to get used to the stimulation and it can become less effective. This is referred to as habituation. Habituation is a common issue in many areas of our life, and it's one of the reasons people have to switch long-term medication sometimes, as their brain and body becomes less sensitive to the same stimulus over time. There are a few different ways to help prevent and overcome the problem of habituation. One way would be to not listen to the exact same track all the time, over and over, by mixing up your playlist with different isochronic tones sessions. Make slightly different versions of the same session, by varying the pitch or beat frequency of the tones, or both. Even listening to different volume levels can help in a small way. Mix different music tracks with the tones. Note: with all of the isochronic tones products I sell, I provide a ‘just tones‘ version, along with 6 alternative background sounds. This gives you plenty of variety so you don't get bored, but it also gives you the ability to change things up and help prevent habitation when you listen to the same isochronic tones session regularly. In most cases, standard isochronic tones tracks don't require headphones to be effective. However, some isochronic tones tracks use what's known as ‘split-hemisphere' stimulation, to help influence a specific side of the brain. In order to do that each ear needs to be isolated and stimulated with a different frequency of ‘beat'. Hence the need for headphones. Before I get into that and how it works, I should explain a little bit about why you would want to target and stimulate a specific side of your brain, and some of the benefits in doing that. There is a well-known myth where people are believed to be predominantly left or right brained. In a 2013 study by Utah University neuroscientists that theory was debunked, and it was proven that we use both sides of the brain equally. However, although we don't favour or mainly use a particular side of the brain in general, it’s absolutely true that some brain functions occur in one or the other side of the brain, or that certain brain functions result in much higher activity on one side, compared to the other. The lateralization of brain function refers to how some neural functions, or cognitive processes tend to be more dominant in one hemisphere than the other. To give you an example in layman's terms, while we are being creative our right brain is probably showing the most activity because that's where most people's brain processes creative functioning. Likewise, most people tend to process language using their left brain. The picture above shows an example of an isochronic tones track used for split-hemisphere stimulation, where a different speed of beat is sent to each channel. In this case, the left channel/ear will receive a 10Hz beat and the right channel/ear a 20Hz beat. To hear the difference in beat speed use headphones and flip each side on an off your ear to compare the difference. These split-hemisphere isochronic tones tracks use a more advanced method of stimulation. Each ear/channel is stimulated with a different speed of beat. This enables you to target a specific side of the brain and increase or decrease the brainwave frequency on that side compared to the other. The brain works in a cross-wired way, with the left brain controlling the right side of the body, and the right brain controls the left. Brainwave stimulation works in a similar way. Although a beat sent to one ear will produce a reaction in both sides of the brain, EEG researchers have noticed that the first and strongest response, is seen in the opposite side of the brain. One of the most notable and common uses of split-hemisphere stimulation is for ADD/ADHD. People with ADD/ADHD are usually found to have an overabundance of slow wave brain activity, particularly in the left frontal region. With my Cognition Enhancer and ADD/ADHD Intense Relief tracks, the left brain is stimulated with a higher frequency of beat, to help address this imbalance by increasing the frequency of the activity on that side of the brain. It's also common for people to experience a hemispheric imbalance before an anxiety-producing event, like a test or public speaking. With my Public Speaking Anxiety product (which is also useful for pre-test/exam anxiety), the left brain is stimulated with a slightly higher frequency. Brainwave frequencies are generally categorized into 5 states. Each state reflects a range of frequencies which are associated with it. Brainwave speed is measured in Hertz (Hz) and relates to how many times they cycle per second. A 5Hz brainwave simply means that it is cycling at a rate of 5 times per second. If you were hooked up to an EEG, you would notice that your brain is constantly producing brainwaves across the whole spectrum. So even when you are deeply asleep, your brain will still be producing some of the faster beta frequency brainwaves, but your dominant brainwave activity will be in the much lower delta range. Our brainwave activity reflects how we are feeling and what we are doing. If slower brainwaves are dominant we can feel tired, sleepy, very relaxed or dreamy. If faster, higher frequency brainwaves are dominant, we can feel more alert, energized or highly focused. With brainwave entrainment methods like isochronic tones, they are used to stimulate and produce more brainwave activity of a specific frequency or range, making that more dominant. If you were very stressed for example, your dominant brainwave frequency would probably be very high. In that situation, you could seek to reduce that by listening to slower speed isochronic tones, which would help calm your mind and bring down your stress levels. 0.5Hz-4Hz – Delta waves are very slow and low in frequency. You produce the most delta activity during your deepest sleep. It's during delta that your body does most of it's healing and regenerating of cells. 4Hz to 8Hz – Theta waves are also mainly dominant during sleep, or in a state of deep relaxation or when we are drifting in and out of sleep. 8Hz to 12Hz – When in an alpha state we are usually very relaxed, calm and resting. Increasing alpha waves can help us reduce stress and anxiety. It's also a mental state where we can stimulate creativity, visualize and improve our ability to absorb and commit information to memory. 12Hz to 40Hz – Beta is a faster and more dominant when we are consciously awake during the day. We are in beta when we are focused, energized and alert. 40Hz+ – Gamma is the fastest in the brainwave range. It has been connected to mental states of high focus, cognitive enhancement and information processing. There have been numerous studies into brainwave entrainment, isochronic tones and binaural beats over the years and you can find some of this research by searching with Google's Scholar search engine. The forum has a lot of experienced brainwave entrainment users as well as newbies, so it's a great place to post questions about the technology. The Neuro-Programmer software help menu – The Neuro-Programmer software has long been the most popular and widely used software for creating isochronic tones, binaural and monaural beats, as well as photic/light brainwave entrainment tracks. You can download and use the full version of the software on a 2-week free trial, without filling out any forms. Once installed you'll have access to the huge list of help files and tutorials. Most of the content focuses on how to use the software with tutorials etc. But alongside that, you'll get invaluable insight into how and why brainwave entrainment tracks are created the way they are, how they can help you. This is one of those great hidden resources you'd never know was there unless you've installed and used the software. Mind Place is one of the market leaders in light and sound stimulation devices and equipment. I own and recommend their flagship mind media system called the Kasina. Mind Place has a very useful support area, which again, like Transparent Corp's, focuses mainly on using their own products. But hidden beneath the surface are a number of useful brainwave entrainment research resources. On their support articles page, you can download PDFs of Michael Hutchison's MegaBrain report. Although it's a bit dated now, Michael's MegaBrain book was quite revolutionary when it came out in 1986, and it's an interesting read. You'll also find a number of other downloadable PDFs relating to AVS (Audio Visual Stimulation) research and insight. The Mind Place Forum is mainly focused on their Light and Sound Meditation Systems, but even if you don't have any of their products yet, it's a friendly and helpful place to check out and pick up BWE (brainwave entrainment) information. Mind Alive is a site run by David Siever, one of the pioneers in the brainwave entrainment industry. They focus on selling light and sound machines and don't supply individual audio tracks. They have a comprehensive brainwave entrainment research area, where they detail the various studies which they have conducted and have been involved with. Isochronic tones and binaural beats are deemed as a safe technology to use. You may come across a few precautionary warning online, but I have yet to find any actual research studies showing that isochronic tones can be problematic for any particular medical condition. Do isochronic tones cause seizures? The most common precautionary warning you may find regarding isochronic tones is for people who are epileptic or prone to seizures. The warning originated regarding the use of photic brainwave entrainment stimulation (which uses flashing light), not because of audio stimulation. Auditory entrainment (AE) is a safe alternative for people who have a history of seizures or believe that they might be susceptible to seizures using photic entrainment. Although I'm not aware of any scientific research suggesting isochronic tones can cause a seizure, if you are someone who is prone to them or in a group at risk of them and you are concerned about it, I recommend that you consult a doctor or medical professional before using them, just to put your mind at rest. When using brainwave entrainment stimulation, the SMR (Sensorimotor Rhythm) frequency range between 12-15Hz has many different potential benefits. When you are experiencing feelings of anxiety and stress, you will usually be producing an elevated amount of higher beta activity, between 20-30Hz or higher. Listening to the SMR frequencies between 12-15Hz can help to reduce those feelings, down to a manageable level at the bottom of the Beta range. How Can Humans Hear Frequencies Below 20Hz? https://www.mindamend.com/wp-content/uploads/2015/02/hear-frequencies-below-20hz.jpg 305 800 Jason Lewis http://www.mindamend.com/wp-content/uploads/2015/10/logo.png Jason Lewis2014-04-13 15:12:352015-02-14 09:12:19How Can Humans Hear Frequencies Below 20Hz?